AncestorPuzzles.com: Assassin of Bob Sloan Convicted! If you have read my post about the "Mysterious Bob Sloan" you know that he was "assassinated" in Stafford, Texas on October 21, 1916. If you don't know the story you may want to read the first post before going any further. I have had incredible success in discovering Bob Sloan's exploits in Washington County, Texas. This success is due to the fact that the Portal to Texas History has digitized a very large collection of newspapers from Brenham, Texas. Researching newspapers on microfilm can be incredibly time consuming. Digital newspapers can open the door to so many stories about our ancestors. All you need are a few carefully crafted search terms. Digital newspapers are such a boon to the armchair genealogist because searches can be done from anywhere in the world without the time and expense of locating microfilms and traveling to the library that holds the films. Inter-library loan is one way to get around this time and expense of going to a distant library. But when you can find the right digital newspaper it is the genealogists equivalent of manna from heaven. Unfortunately the newspapers for Fort Bend County, Texas have not yet been digitized. The good news is that, some of the events of Fort Bend County have been reported in the Houston Post. After several weeks of searching for information on the murder trial of Sherman Allen, I finally found out why there was no further mention of him. His case was dismissed! The University of North Texas has been in the process of adding the Houston Post to the digital newspaper collection. The most recent additions of the Houston Post on the Texas newspaper portal were added on April 22, 2015. So this article was not there when I searched for Sherman Allen a few weeks ago! The lesson for me was that you need to keep checking back with the newspaper portals to see if there are any recently added titles of interest. So now we can try to answer the obvious question: Why did Frank Robinson kill Bob Sloan? There were many familiar names on this list of witnesses that were also on the list from the Sherman Allen case. 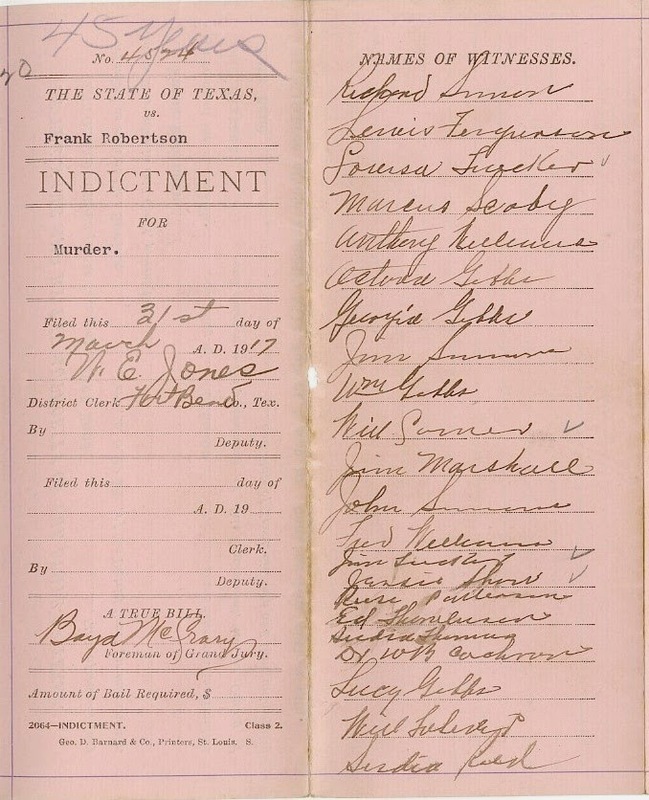 These family names will be immediately recognizable to anyone with an interest in the African American families of Stafford, Texas: Gibbs, Ferguson, Marshall, Patterson, Reed, Tucker, Toliver and others. These are also names that are found in abundance at the New Hope Cemetery in Stafford. What evidence did Fort Bend County have to convict Frank Robinson of the murder of Robert Sloan? What was the motive? Why was it called an "assassination"? Mr. Sample at the George Memorial Library went through the district court minutes and was able to locate a case number for Robinson, 4524. Unfortunately the usual red envelope was missing and the only item in that spot was the indictment for Robinson. The indictment lists his name as "Robertson." Mr. 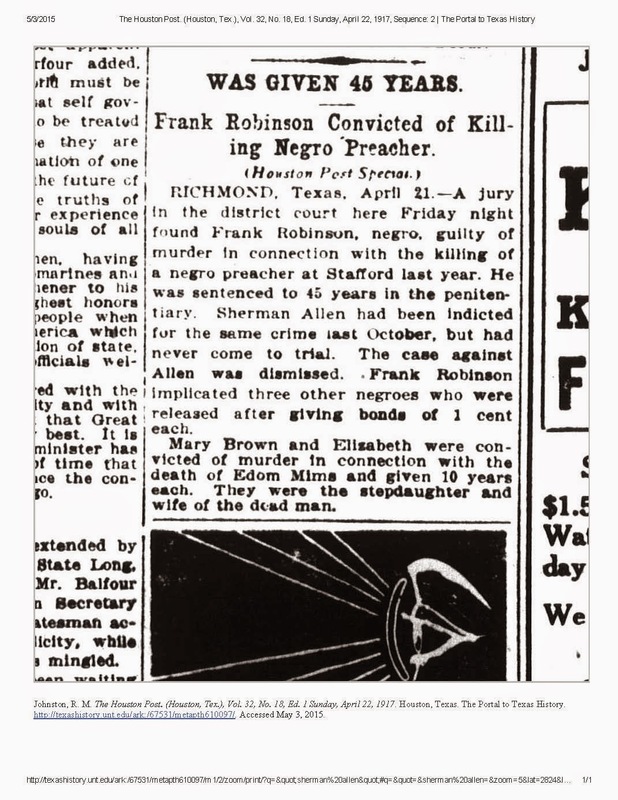 Sample also searched the Rosenberg Herald, April to the end of May 1917 and did not find any mention of Mr. Robertson [Robinson] or the murder case. So it appears that the motive for this crime will remain a mystery. If you do not have access to digital newspapers for your locality of research, you should always contact the nearest local library. The local library probably has the newspapers on microfilm and many librarians are willing to assist you if you have a specific item that you are trying to find. I was able to find a Texas Prison record for Frank Robinson at Ancestry.com. Neighbors: These names are the heads of the households only. All are black except where noted. Austin Gibbs 31, Jim Washington 64, Tony Price 38 [Mulatto], Sam Paulkil 36, Reese Packer 40 [White], Nick Walter 39 [White], Charlotte Stringfellow 35, Dan Griffin 78. 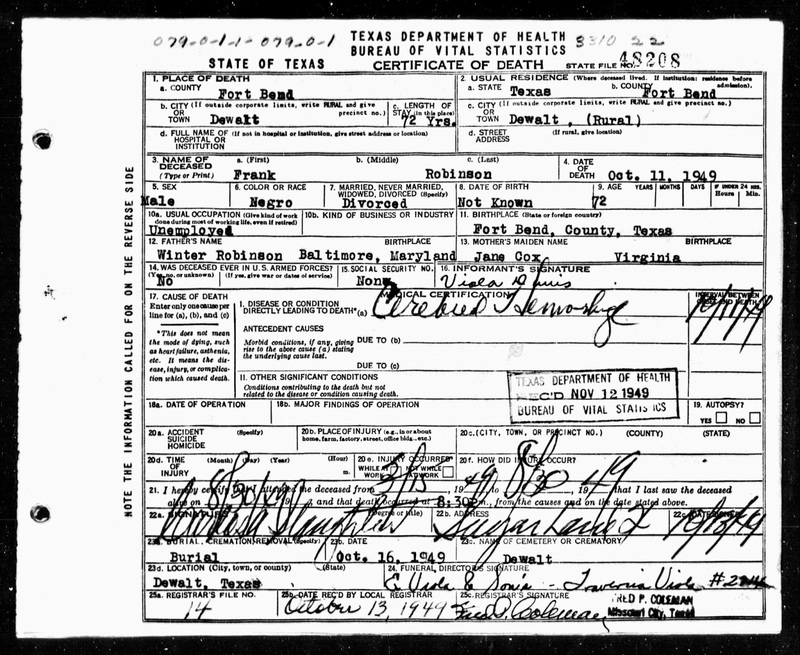 In 1920 Frank Robinson was listed in the census at the Harlan State Prison Farm in Fort Bend County. We know from his prison record that he was pardoned in 1926. By 1930 he is back in Fort Bend County residing alone in Precinct 3 on the Blue Ridge Road. His marital status was listed as widowed. In 1940 he is still living alone working as a farm laborer. On this census his marital status is divorced. 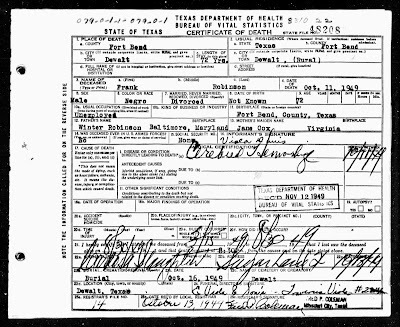 The last record we have of Frank Robinson is his death certificate. The following pages tell us a little about the history of Dewalt and its cemetery. The Robinson family was integrally involved in the history of Dewalt. There are no memorials to Frank Robinson at either FindaGrave.com or BillionsGraves.com so it may be an unmarked grave. There were no children listed with Frank Robinson and his wife, Clara so apparently there are no descendants to track down. There was no obituary in the online obituary database at the George Memorial Library. Perhaps we will never know why Frank Robinson shot the Rev. Robert S. Sloan but we will never stop wondering. Johnston, R. M. The Houston Post. (Houston, Tex. ), Vol. 32, No. 18, Ed. 1 Sunday, April 22, 1917. Houston, Texas. The Portal to Texas History. http://texashistory.unt.edu/ark:/67531/metapth610097/. Accessed May 3, 2015. [database on-line]. Provo, UT, USA: Ancestry.com Operations, Inc., 2012. Ancestry.com Image 205 of 258. Ancestry.com. United States Federal Census [database on-line]. Provo, UT, USA: Ancestry.com Operations Inc.